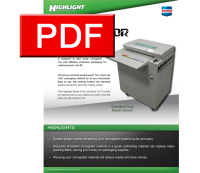 The economical and reliable Highlight Shred-It-Tor shreds scrap corrugated cardboard into useful packaging material. of your shipments. Easy to use, the working surface has standard size guides marked on it for accurate cutting widths. 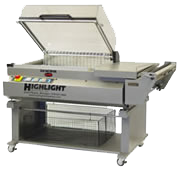 The Highlight Shred-It-Tor will shred 16.75 inches of material and cut any additional width to be fed back into it. Highlight's Seal & Shrink™ system incorporates the sealing of the shrink film and the heating all in one efficient, compact machine. Available in four models to fit your exact product from the smallest SS-1115, SS-1218, SS-1621, to the largest SS-2431 (shown). The numbers following the SS are the lengths and widths, respectively. Electronic controls are easy to use and allow for full control of seal time, shrink temperature, and shrink time. Two operating modes: seal only, and seal and shrink. Film is automatically perforated before it goes into the chamber. Product rate depends on settings, but 5 products per minute is typical.